Some of you likely know me, and many of you know how much my eating habits resemble that of my rabbits. While not an official vegetarian, I eat mostly greens, beans, and rice. It sounds humble, but I’ve really grown to love my diet. So, I thought I’d share some of my shopping habits with you all to see how our staples compare to each other’s. I need to go shopping right now, so it’s a little more sparse than usual, but this is a fairly decent representation of what I have on hand at all times. Having these staples not only provides me with a good way to manage my nutrition, but also allows me to always have a go-to meal when I need it. I also love that I start from scratch on most things – it allows me to express some degree of creativity while I’m simply making dinner. Let’s start with the pantry! Rice. I have tons of rice on hand at all times – I’m developing a huge fondness for this grain. I think I might even like it more than pasta at this point, as it’s less refined and not too much harder to make. Oats. I love oatmeal in the morning! My breakfast of choice: toss 1/2-3/4 cups of rolled oats (not instant) into a bowl with ground flax seed, a heaping spoonful of peanut butter, cinnamon, and honey into a bowl and cover it with 1-1 1/2 cups of boiling water. I let it sit while I get ready, and then it’s good to go! Peanut Butter. Worth it for the above mentioned use and random snack cravings. I try to get bulk – I’d love to get organic, but that’s quite a bit more than I’m willing to spend right now. Vinegar and Oil. I love my apple cider vinegar (put a tablespoon or two of it in warm water with some honey and ginger and you’ve got a delicious beneficial drink), and I also use it as a salad dressing. Mixing vinegar, oil, pepper, and garlic powder is an AMAZING way to spice up kale. Plain white vinegar, too, is an essential I always have on hand for cleaning my hair, rinsing dishes, cleaning carpet, and getting the rabbit cage smelling like new again. And of course, beans. I can’t get enough beans. I make refried beans in the crock pot at least once a week and eat them up like it’s my job. I add them to rice all the time for an extra protein boost (since I don’t eat a lot of meat). In fact, while I’m writing this post, I’m gobbling up some black bean brownies since I had a sweet tooth that wasn’t going away. Pasta. Oh my goodness, I never ever thought I would put pasta on this list. Lord almighty, how I love my mac and cheese, and ziti with robust red sauce, and fettuccine alfredo. Oh fettuccine. However, I went through a phase in college where I almost exclusively ate spaghetti with plain marinara sauce, and I was constantly sluggish and moody. I’ve realized that by cutting back on pasta and adding in more diversity, I’ve been better off. I will occasionally have pasta on these shelves but I compensate by making my own sauces from scratch instead of buying jars of anything pre-made. I just know that once the pasta ball gets rolling, it’s nearly unstoppable, so this is definitely a personal choice. Instant anything. I avoid anything “Hamburger Helper”-like and anything with “Instant” in the name. This includes instant oats and instant rice – I think it comforts me to know that my food isn’t somehow modified to encourage me to be a busier person. Again, a personal choice, but I feel like there are benefits to slowing down and connecting with your food. Weird? Yes. Working for me? Absolutely! Sugar. This is going to sound crazy, but I haven’t had regular sugar in my apartment for about 4 months. I don’t put it in coffee, rarely bake, and when I do, I use what’s left of my absurd confectioner’s sugar stash. I avoid baking because there’s only two of us in the apartment, and we have a tendency to pig out on anything out of the ordinary in our sight. Hence why that third slice of black bean brownie is starting to look really good, and my fiance isn’t even here to stop me. What are your staples, and what do you shy away from? Do you agree with my lists? Have at it in the comments below! This entry was posted in Home and tagged diet, food, simple eating, simplify, staples, vinegar. Bookmark the permalink. 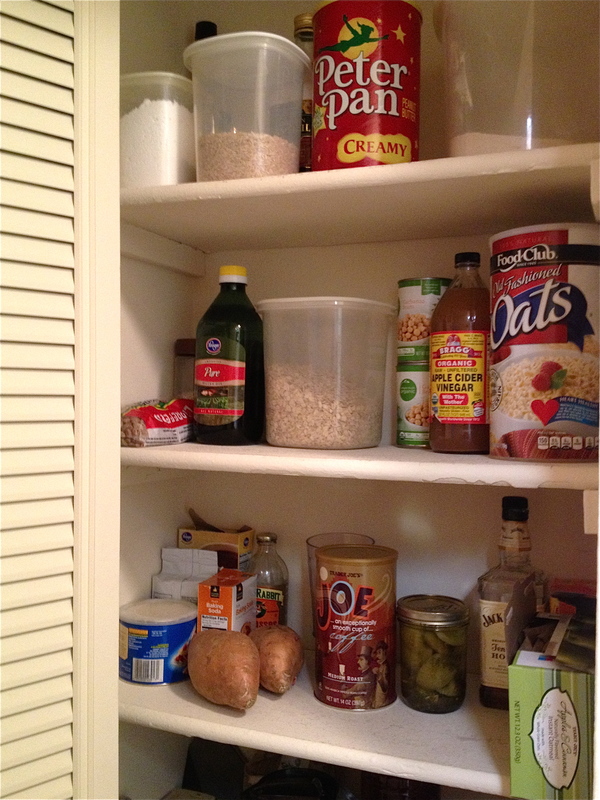 Our pantries are almost identical! I’m mostly vegan except for a bit of cheese however I could never eliminate sugar. I try not to buy any processed foods either. Just recently gave up crackers. I’m a new reader and am enjoying your blog. I’m glad to hear that Tina! Sugar is very hard, especially outside of the house (it’s nearly impossible). It does require quite the change of mindset, but it’s really fun! Thanks for reading, and welcome to my blog!! Came over from Courtney’s post. Glad I did! Nice list. I try not to keep any sugar around either. A couple recent additions to my pantry are quinoa and almond butter. I make the quinoa in the mornings in place of oatmeal. I add cinnamon, raisins and walnuts. Plus a little half and half or almond milk. Guess I could put almond butter in there too! Thanks for the post. Thanks Jeff! You know, I have never thought of having quinoa in the morning – I’ll have to look into it, since there are so many benefits associated with it. That sounds delicious! Thanks for sharing! Hey all; I’m new to these sites, but oh so excited. Wanted to share with you what my nutritionist told me: Soak all beans/grains over night b4 cooking, so as to get all the nutrients contained. Also – my two new faves……….wild rice (lower in carbs than brown; not actually rice, but has a nice nutty taste and texture. I also love quinoa. I use both grains with eggs in am, and in tossed salads. Q. has more protein than other grains. Happy simple eating! Hi Michelle! That’s a great tip – thanks for sharing. I haven’t tried wild rice, but I’ll definitely look into it. I’m really trying to get back into quinoa! I was eating it often last winter, but have since fallen away from the habit 😦 I certainly need as much protein as I can get, since I don’t eat a whole lot of meat. Thanks for reading!